Alftand is a large Dwarven ruin southwest of Winterhold. It contains four zones: Alftand Glacial Ruins, Alftand Animonculory, Alftand Cathedral, and Alftand Ruined Tower, which is a separate building. 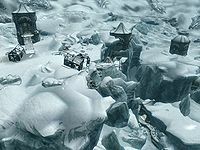 These ruins have been partially entombed in ice and are one of only three sites that give access to Blackreach. The remains of the camp of an ill-fated expedition led by Sulla Trebatius are perched on the edge of the cliff. The camp includes two derelict shacks with holes in the walls and roof and missing doors, an unlit campfire and several destroyed tents with bed rolls. Inside the shack farthest to the north is an adept-locked chest and a journal titled Expedition Manifest written by Sulla Trebatius, with some background information and a list of expedition members. There is also a tower housing a lift, but a closed gate which can only be opened from the inside blocks access. Follow the catwalk north of the camp to the entrance of the Alftand Glacial Ruins. You enter via wooden catwalks hanging off the side of an ice crevice, through into an ice tunnel that has many crates and barrels throughout. One of the crates near the entrance has a Dwarven metal ingot on top. Follow the tunnel as it twists and turns until you come to an unlit campfire with a cooking spit that has been knocked over. Sulla's Journal is resting on a barrel to the left just before the campfire. A knapsack leans against the same barrel. Behind the campfire is a single bed roll with two unlocked chests, one wooden and one Dwemer, beside it. There is also a pickaxe beside the fire. The ice tunnel leads to another camp with blood splashed all over the floor and another unlit campfire. There are five more bed rolls, with a lute laying between two of them and a copy of Chimarvamidium, the non-skill book version, under a bowl on top of a barrel. Continue along the tunnel until you reach a wood-slated wall on the left with barrels and crates behind; you can see through into another tunnel with a Dwemer chest and loose coins on the floor and a potion of minor healing that you can reach on top of a barrel. At this point you can hear part of an argument between J'darr and J'zhar, two Khajiit brothers. Shortly past here the tunnel turns into typical Dwemer architecture, but is still partially filled with snow and ice. Passing the remains of a Dwarven spider, eventually you enter a large room with a worktable loaded with the wreckage of two Dwarven spiders, a copy of Dwarves, v2, an empty random soul gem, an iron dagger, a copy of Dwemer Inquiries Vol III, three soul gem fragments and a book of Research Notes. Behind the table, among the rubble is an unlocked Dwemer chest. Behind a barred doorway to the north is a lift to the Alftand Animonculory; it can only be accessed from below. To the right of the barred doorway is a bed roll and a copy of Dwemer Inquiries Vol I on top of a barrel. To the south there are two Dwarven scuttles, one of which is blocked by rubble, the other houses a Dwarven spider. To the west is a ramp, with another Dwarven spider near the top. The path turns to the south and leads back into the ruins. Passing a fork to the west, it leads to the area you could see through the wooden slates, including an unlocked Dwemer chest, three loose coins, a small coin purse and a leveled potion of healing on the ground and, on top of a barrel, an apothecary's satchel. Back to the west fork, the path descends past the remains of a Dwarven spider. Just before the next corner there is a scuttle on the right from which a Dwarven spider may ambush you. Around the corner, the tunnel continues to descend to an area where the hostile J'darr is standing over his brother's corpse. J'zhar's Journal is near his body and has information about them. Once you have dealt with J'darr, who is armed with a woodcutter's axe, searching the area will find a random potion of stamina, a leveled healing potion, a leveled strength potion, and a woodcutter's axe. J'zhar's pack looks just like an ordinary knapsack and contains several empty skooma bottles and two random potions. The path continues to the north past a barrel holding a bottle of alto wine, a small coin purse, and four loose coins. Just before the next opening, there is another barrel to the left holding a small coin purse, a barrel to the right with a lit lantern and Dwemer cup, and a pickaxe and shovel lying on the ground in between. Straight ahead through the opening is a table with Umana's Journal, some pieces of Dwemer metal, and the remains of a Dwarven spider on top. Follow the path around the corner to a large room with a table holding several Dwemer items. There are several oil slicks on the ground around and on a raised area. On either wall are scuttles that house Dwarven spheres. In the northwest corner of the room there is a table holding more pieces of metalwork and a random filled soul gem, behind the table are series of three pistons which thrust up vertically. You can "ride" those pistons up to get access to a ledge with two unlocked chests and a leveled healing and strength potion, two Dwarven metal ingots and a flawless emerald. You can also use Whirlwind Sprint or jump across the gap to bypass the following section and simply follow the path around the room to the Animonculory. Exit the room via the northeast corner. This passage has flammable gas in the air. The next room contains a forge, as well as many Dwemer metal items and the remains of two Dwemer spiders around the room. There is also a large oil slick on the ground. There are several scuttles and two of these house Dwarven spiders. 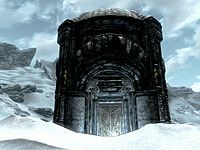 In the northwestern corner there is a novice-locked gate, behind which are two chests; one apprentice-locked and the other adept-locked, along with two sets of shelves holding various Dwemer items. Through the door to the west is a flight of stairs leading up to a T-junction with an unlocked chest; there is a pressure plate in front that triggers a spear trap from the wall. 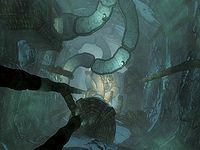 One Dwemer spider scuttles in the corridor to the south, and another can be found down a flight of stairs to the north; beyond the stairs the path is blocked by a cave-in. A cloud of flammable gas at the bottom of the stairs can be ignited to help fight the second spider. When it is destroyed, an adept-locked chest can be found in the rubble. Taking the path south, there is a bedroom to the east with shelves holding a random stamina and healing potion. Opposite is another cave-in area. Further along there is a cave-in area to the east with an apprentice-locked door opposite that leads to a second bedroom with two stone beds, two tables, and an unlocked chest, all guarded by a Dwarven sphere. The tables hold several pieces of Dwemer metalwork. The path continues to the south, up a flight of stairs. At the top of the stairs is another T-junction with two sets of shelves ahead; a Dwarven spider, a table holding metal items, and a random potion to the west; and the path onward to the east. Before turning to the south, you can look down upon the first big room (the one with the two Dwarven spheres and the three pistons). The path goes around the western and southern walls; a series of five horizontal steam pistons can push you off into the room below if you're not careful. There are scuttles housing Dwarven spiders in the southwestern and southeastern corners. The path traverses some rubble at the end and continues along the eastern wall. At the end the path turns to the east before leading to the door to the Alftand Animonculory. Upon entering the zone there is a bedroom to your left containing an unlocked chest and several pieces of metalwork on two tables along with a Falmer helmet and shield. Across the hall from the bedroom is a cave-in. The path continues past this to the east. There is a second caved-in area off this path to the north. At the end of the corridor is a door that opens into a large room with pipes traveling across in front of you. There is a gap between metal panels that leads under the pipes and winds its way to an adept-locked chest. Next to the chest is the body of the Wood Elf Endrast, a member of the expedition, a lockpick, and his journal that tells how he ran away after being captured by the Falmer and hid here until he died. To the right of the pipes are a flight of stairs leading up to an area covered in an oil slick. There are a Dwarven spider and sphere in this area and a scuttle on the north wall that releases a second spider. Against the south wall is a set of shelves holding a random potion and various pieces of Dwemer metal items. To the left are three chaurus egg sacs. Opposite the shelves is a table with metal items and a Falmer sword. More chaurus egg sacs can be found in the northeastern corner, along with a gap in the floor where you can drop down to Endrast's body. To the east there is a ramp with a spinning blade trap that is triggered by a series of pressure plates. At the top of the ramp are some more egg sacs and high on the south wall a scuttle that houses a Dwarven spider. Around the corner to the north a lever on the right lowers a set of bars allowing access to a huge vertical cavern. Take the walkway across to a caved-in area with a Dwarven spider, a novice-locked chest, and a couple of sets of shelves holding a random potion. There is a ramp leading down on your right. Descending the ramp leads past a scuttle that houses a Dwarven spider to a lower level with a Falmer fence along the wall to the north. Behind this are several chaurus egg sacs and an apprentice-locked door to the east. You can look off the edge of the ramp to see yet another platform below you with a ramp coming out of the south wall behind some pipes. There are even more levels below that one although you can't see how much further down the shaft goes. Through the door is a treasure room with two gates. The gate to the south is already open, with an unlocked chest behind it; the gate to the east has an expert-level lock, with a table holding a Dwarven helmet, a random potion of magicka, and a leveled potion of resist element. There are also two more chests, one with a master-level lock, the other unlocked, and a lootable skeleton holding in its hands the Lockpicking skill book The Locked Room. Between the two gated areas there is a caved-in section that contains nothing of interest. There is no ramp down from the landing; you must jump down to the next level. On landing you find the broken ramp that was mentioned in Endrast's journal. Beside this is the body of the Orc Yag gra-Gortwog, another member of the expedition, along with a potion of minor healing. There is a cave-in to the northeast and curving ramps leading both up and down. The ramp up to the west leads up to an unlocked chest guarded by a steam piston that can be triggered by a pressure plate, but extends intermittently regardless. At the top of the ramp is a scuttle housing a Dwarven spider. The ramp down is to the east, past a waterfall. Care needs to be taken as there is another piston that can push you off the side of the ramp and several Falmer and Dwarven spiders in the area. At the bottom is a landing along the eastern wall of the cavern. A tripwire that triggers a Falmer claw trap is located just past the waterfall. Past the trap, another curving ramp leads down to a landing with a skeever near a cave-in (there is a chunk of Solid Dwemer Metal hidden between the cave-in and the cavern wall to the left.) From here a straight ramp leads down to a door. The path passes under a flame spout; you can either wait for it to temporarily stop or just go around. The door opens into a multi-leveled room. To the left are several stone tables holding various Dwemer items. On the levels below, there are two Falmer patrolling between two Falmer tents and an alchemy lab. On the first level down, there is a large set of shelves against the northeast wall. The bottom shelf holds a large Dwemer strut, a piece of silver ore, an orichalcum ingot, a piece of iron ore, a Dwemer cog, a Dwemer bowl, a piece of orichalcum ore, and a silver ingot. The top shelf holds nothing of interest. In the northern corner of the lowest level of the room is the alchemy lab on a table surrounded by a sample of bleeding crown, a sample of scaly pholiota, an orange dartwing, a butterfly wing, a Nordic barnacle, a sample of blisterwort, and a salt pile. There is a second empty tent in the western corner. Against the southeast wall is a pen with several Dwemer items, a bottle of Nord mead, a hide shield, and a woodcutter's axe scattered among human bones. There are more shelves further along the southeast wall that hold little of interest, however, a piece of gold ore and a few minor Dwemer items can be found underneath them. The path turns northwest and passes through an open door onto a balcony with metal grating that overlooks the next room. The route across the balcony to the stairs is bisected by an oil slick. The stairs lead down into the main part of the room which houses three Falmer tents in the northern, western, and southern corners. The room has a large structure in the middle and an oil slick covering most of the floor. There are two flame spouts firing intermittently from the main structure towards the east and north. There are three Falmer in the room, one near each of the tents. 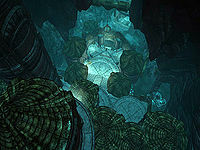 On the other side of the metal grating is a row of large shelves, the top row can be accessed by jumping from near the top of the stairs and holds several pieces of Dwemer metalwork. The bottom row holds a Dwemer dresser containing a few minor pieces of metal. Between the main structure and these shelves are bone chimes. Behind the tent in the western corner is an anvil and workbench. Between these is a large fire that may have been used as a forge at some point in the past. To the left of the workbench along the southwest wall are a set of shelves that have piles of coals under them and a selection of mushrooms and charred skeever hides cooking on top. Inside the tent in the southern corner is an expert-locked Falmer chest. Past this is a corridor heading to the southwest and an open door at the top of a couple of flights of stairs heading down. The stairs lead to a room with three leveled Falmer, including at least one magic user. At the bottom of the first flight down, on your left is another flight up that leads to a small area with a table holding several ruined books and a Dwarven dagger. It may be advisable to kill the nearby Falmer before looting this section to prevent unexpected interruptions. Opposite the stairs are two shelves with more ruined books and what appears to be a row of seven Falmer ears (see bugs). At the bottom of the stairs is a metal grating that divides the room into two sections. There are two Falmer tents in the western and southern corners, several pieces of torture equipment, and a couple of tables. Against the northeast wall are some chaurus egg sacs. To the northwest is an open gate leading to a lift that takes you up to Alftand Glacial Ruins. To the left of this gate is a sack, a random potion, a pickaxe, and Sulla Trebatius's pack, which contains an Imperial officer's helmet, a torch, and possibly some gold. The lift takes you up to a small area on the other side of a barred doorway seen previously in the first zone. In this area is a sack of foodstuffs, two patches of chaurus egg sacs, and a lever that opens the gate. This allows quick access to the exit of the ruin so you can take out treasures collected and/or restock supplies as necessary. Inside the tent to the west is a chaurus egg, a skeever tail, and a Falmer bow and war axe. To the left is a rack with a bowl of coals and human bones, and to the left of this is the dead body of the High Elf Valie on a table with shackles by the hands and feet, along with a Dwarven dagger and a bottle of random poison. There is a second table with shackles on the other side of a gated cell-like area. The second table has a portion of human flesh, two pieces of leather, and lots of gory human bones. Opposite the torture tables, against the room partition are two tables holding a scroll of cure wounds, an iron dagger, a thistle branch, a hawk beak, a sample of bear claws, a lockpick, a grass pod, a dragon's tongue flower, a bunch of lavender, a bunch of tundra cotton, a sample of hawk feathers, two blue mountain flowers, a red mountain flower, a nightshade flower, a flask of Dwarven oil, a rare small pearl, a silver ingot, two soul gem fragments, a garnet, a bottle of wine, a bottle of skooma, a flute, a pine thrush egg, a horse hide, a set of blue mage robes, a piece of leather, and two sacks of foodstuffs. To the left of the gory table with shackles is a tanning rack. The second tent in the southern corner contains a chaurus egg, a piece of chaurus chitin, and a quiver of Falmer arrows. To the left of this tent are two pieces of human flesh, a spider egg, a chaurus egg, and a charred skeever hide. Beyond these items is a fire with a set of shelves being used as a cooking grate with a small Dwemer plate metal and a charred skeever hide on top cooking. To the north and against the northeast wall are two more tanning racks opposite a dead Falmer lying in front of a door. The door leads back into the tall main shaft on a lower platform with a curving ramp leading further down. At the bottom of the ramp are stairs that lead down to the ground floor where you will find three more Falmer, including at least one magic user, and a frostbite spider. There are also three empty Falmer tents. To the northeast is a short corridor that passes through a door before it turns to the northeast and descends a ramp. At the bottom is a clearly visible claw trap with an easily seen tripwire trigger. Past this is a door that opens into 'Alftand Cathedral'. The Alftand Cathedral is the final room in Alftand; it houses a lift to the surface as well as the passage to Blackreach. Upon entering there is a gate that has been knocked over, beyond which are two stone tables. On the first table is a leveled potion of the defender, and a caved-in area to the south has a leveled healing potion among the rubble. The path continues to the right of the gate. Care is needed as there are three pressure plates, all of which activate a slicer trap that comes from the ceiling. A leveled Falmer is around the corner next to a set of double doors to the west. Through the doors is the main Cathedral room, with a flight of wide stairs leading up to the main floor. Inside, one or two Falmer patrol the area before the barred gate, along with possibly a frostbite spider, a skeever or a Chaurus Reaper. To the right of the barred gate there is a Falmer tent containing a Falmer bow, a quiver of Falmer arrows, three chaurus eggs and a couple of chaurus egg sacs. Between this tent and the barred gate is an apprentice-locked Falmer chest and to the southwest is a second Falmer tent containing several chaurus eggs, two skeever tails, a Falmer shield, a Falmer war axe and a quiver of Falmer arrows. To the left of this tent is a novice-locked Falmer chest. There are quite a number of chaurus egg sacs, a patch of white cap mushrooms and one of bleeding crown around this area. On a platform at the top of the stairs is the lever that operates the spears blocking the gate and two chests; one unlocked and the other adept-locked. Near the stairs are two Falmer tents, both containing fire pits. Inside the first one are three chaurus eggs and a Falmer war axe; the second contains an unlocked Falmer chest. Near the tents are a few more patches of white cap mushrooms, several chaurus egg sacs, three loose chaurus eggs and between the tents you can find several Glowing Mushrooms growing on the rear rock walls. There is also a way of climbing up to an area with large strange mushrooms normally only seen in Blackreach, although there is nothing of interest up there. Once through the gate, and after climbing the first flight of stairs there are two unlocked chests on the right. Further on there are two Dwarven Centurions. One Dwarven Centurion is destroyed and is lying prone before its station and the other activates as you approach it. Past the Centurions are more stairs leading up to another unlocked gate. To the right of this gate there is an apprentice-locked chest. Just past the gate are the last two expedition members, the Redguard Umana and the Imperial Sulla Trebatius, who begin fighting after a brief exchange of words. You can remain hidden and listen to their exchange and then let them fight it out with each other, before tackling the winner. Either will be hostile to you. Umana is carrying the enchanted shield Targe of the Blooded and because of this will normally be the winner. In the center of this area is a Dwarven mechanism, with a chest next to it; if you have the Attunement Sphere, you can activate it and the floor will retract into stairs leading to Blackreach. Behind the Dwarven Mechanism is the master-locked gate that can be unlocked by the key found on the Centurion you fought and Alftand Lift, which will take you to Sulla's camp on the surface. Upon exiting to the surface there is a lever in front of you, to the right of the gate that opens it allow future access to the lift, until the area resets. There are two entrances to the Alftand Ruined Tower. There is an entrance to the northwest of the Alftand map marker (approach from the northwest, i.e. from Frostflow Lighthouse) that enters near at the top, and another reached by approaching the ruins from the north and following the worn path and enters at the bottom. As the worn portion of the path ends, bear left and note a Dwemer tower that has fallen over just ahead. This marks the start of the gap in the ice. Follow through the ice gap until it ends. Climb a few feet up the quickly steepening slope at the end of the path just enough so you can jump onto the ledge on your right, and the entrance is there on your left. If you come upon the ruins from the south you need to travel around the ruins southward in order to reach the path. Entering through the lower entrance leads directly into an icy chamber with two flights of stairs rising opposite. As you approach, two leveled Dwarven spiders will emerge from Dwarven scuttles on the walls. At the top are twin open doors, however, behind the right-hand one is a cave-in. The other leads back and up another flight of stairs. There is smeltable and unsmeltable Dwemer metalwork and Dwarven arrows on the floor and shelves throughout the tower. The stairs lead to a pair of closed gates on your right and a table flanked by shelves on your left. On the shelves in addition of Dwemer metalwork is a piece of iron ore, a piece of silver ore, and an apprentice-locked chest with a random potion of magicka beside it. While on the table either side of a button is a piece of gold ore and a copy of the spell tome: Lesser Ward. The button opens the gate opposite and also trigger a twin flamethrower statues that fire constantly down and across the passage in front of the now open gates. There doesn't seem to be any way of disabling the fire trap, or of opening the door without triggering it; All you can do is run through the fire to explore the rest of the area. Using Whirlwind Sprint or Become Ethereal dragon shout will allow you to get past the trap without taking fire damage. Beyond the gate are stairs leading up with a button on the left that closes the gates and stops the flames. At the top of the stairs are several pressure plates all of which trigger spear traps from the ceiling. The passage takes a couple of turns around behind a metal grate where a leveled Dwarven sphere emerges from a scuttle. There is a table with more metal grating over it and a metal chair and two sets of shelves on the far side. On the table is a piece of gold ore, an iron ingot, and a silver ingot. On the shelves is another piece of iron ore. To the east are two pedestals with buttons in the top that also trigger the spear traps seen on the other side of the grating. To the south are a series of flights of stairs with the remains of a Dwarven spider partway up. At the top the passage turns west and continues to climb. There is an expert-locked chest and a metal dresser at this point. Two more Dwarven spiders emerge from scuttles and there are several wide sets of shelves holding a random potion of strength, a random potion of magicka, two iron ingots, a silver ingot, a piece of iron ore and a piece of silver ore. Under the shelves on your right is an adept-locked chest. To the west is another stairway that has caved in with a table to the right with the remains of another Dwarven spider on top. A passage to the south continues through an open door and up a spiral staircase. At the top is the other exit/entrance with more shelves. This area does not connect to the other Alftand areas. The Alchemy ingredient Small Pearl cannot be harvested. Alftand is one of the few places one can be found as part of a loot drop. If you travel far enough into the crevice that is southeast of the Alftand Ruined Tower, you can activate the map marker and subsequently fast-travel, in turn negating a portion of the ruins. While in Alftand Animonculory you can use Become Ethereal to simply jump to the very bottom, thereby avoiding most of the area and saving considerable time. You can never wait in Alftand Cathedral, not even after the Elder Knowledge quest has been completed. Although the interior of Alftand does not respawn, the enemies in Alftand Cathedral respawn after 10 days. The Falmer ears and some of the ruined books lying on a plank in the Animonculory can't be interacted with. It may be possible to recover the Falmer ears by using a ranged area of effect spell. Several Glowing Mushroom in the Cathedral cannot be interacted with ? This page was last modified on 22 June 2018, at 04:49.